The faculty and staff of Bartlett Elementary are deeply committed to providing a safe environment for your children. This is one of our highest priorities. It is our sincere desire to make the arrival and dismissal procedures safe, quick, and efficient for all. Bartlett Elementary School's transportation plan was developed with the help of the Bartlett Police Department. Please review this procedure carefully. We would request that no student be checked out after 2:15. Only Bartlett City School buses, daycare vans, and preschool drop-offs/pickups will be allowed in the front parking lot between the hours of 7:30 - 8:00 a.m. and between the hours of 2:15 - 3:10 p.m. 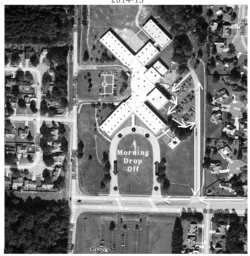 Visitors arriving at school before 8:00 a.m. will be asked to park in the designated parking areas in the u-shaped drive on St. Elmo, and enter the school from the south entrance. The front entrance will be secured during the times listed above. · To reduce confusion regarding bus numbers and routes, the Transportation Department asks all riders to pay attention to the printed sign on the second bus window and not the number that may be on the side of the bus. While the physical bus may change from day to day, the printed sign on the bus window will remain constant and will always indicate which bus your child is riding. · If parents have issues and need to speak to a representative at the Bartlett Durham bus lot, then the number is 383-2216. This number is also posted on the system website. · Please contact Durham if the bus is late or missed a stop. You can always contact the school’s transportation coordinator to address issues. Morning car drop off will be in the side loop off St. Elmo. Afternoon pick up will be in the faculty parking lot. You must have a number to pick up through the car line. Otherwise, please pull around and check out through the front office. Students must enter and exit the car on the right/passenger side. Drive slowly.Refrain from passing other cars. Refrain from using mobile phones for talking or texting. In the morning, SPED car riders will be dropped off in the back of the gym. In the afternoon, SPED car riders will be picked up in the U shaped loop off St. Elmo. Children walking from behind the school will walk on the sidewalk and enter the school through the south entrance of the U shaped drive off St. Elmo. We call this side door walkers. Front Door Walkers (across Billy Maher) will enter the building using the front entrance. Crossing guards are at both locations for the safety of our Little Panthers. Y-Care parents must drop students off before 7:30 a.m.
After 7:30 a.m., Y-Care students must be dropped off in the car rider lane.